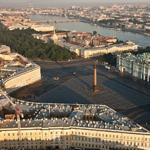 St. Petersburg is considered to be one of the most beautiful cities in the world. Often called the Venice of the North, it is situated on over 40 islands which are interconnected by an astounding 342 bridges. 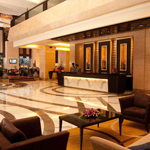 Our guide will come to your hotel (lobby area) or any other indicated address to begin the tour from there. There also will be a driver waiting at your hotel entrance. The tour is done by car/minivan. We use licensed drivers with cars (up to 3 people) or minivans (4 - 7 people). 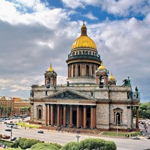 During this tour, your guide and driver will take you to the most picturesque areas of St. Petersburg where you will be able to make multiple photo stops at your request, while engaging you in entertaining and informative discussion about the city's history and present-day life. 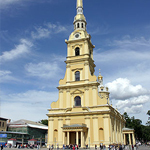 The Peter and Paul Fortress is a simbol of St.Petersburg and one of the few remaining fortresses of the 18th century, the burial place of Russian emperors, as well as a former political prison of Russia. It was the one the history of St. Petersburg began with. 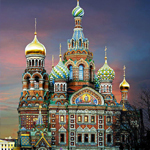 The magnificent Church of the Savior on Spilled Blood is one of St. Petersburg's most memorable landmarks. The church, built at the end of the nineteenth century, is constructed in a classical Russian style decorated with colorful domes and glazed tiles. Tasting the local cuisine is an important part of the new culture discovery. 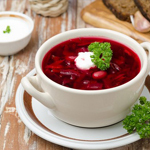 We have created special 3-course sets for you: Russian and Georgian. There is also a set for kids. The dome of St. Isaac's Cathedral dominates the skyline of St. Petersburg and its gilded cupola can be seen glistening from all over the city. You can climb up the 300 or so steps to the observation walkway at the base of the cathedral's dome and enjoy the breathtaking views over the city. At the end of the tour we will take you back to your hotel or to any other place you would prefer.